The Certified Information Security Manager?(CISM?) certification program was developed by the Information Systems Audit and Controls Association (ISACA?). It has been designed specifically for experienced information security managers and those who have information security management responsibilities. The Complete Guide to CISMCertification examines five functional areas-security governance, risk management, information security program management, information security management, and response management. Presenting definitions of roles and responsibilities throughout the organization, this practical guide identifies information security risks. It deals with processes and technical solutions that implement the information security governance framework, focuses on the tasks necessary for the information security manager to effectively manage information security within an organization, and provides a description of various techniques the information security manager can use. The book also covers steps and solutions for responding to an incident. At the end of each key area, a quiz is offered on the materials just presented. Also included is a workbook to a thirty-question final exam. 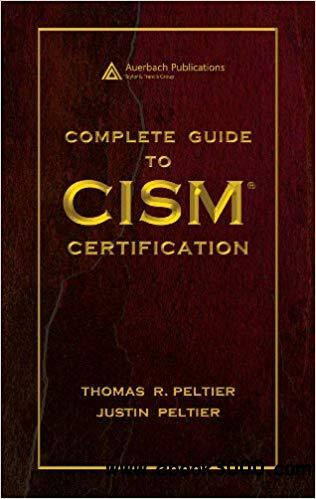 Complete Guide to CISMCertification describes the tasks performed by information security managers and contains the necessary knowledge to manage, design, and oversee an information security program. With definitions and practical examples, this text is ideal for information security managers, IT auditors, and network and system administrators.